Whether we purchased or rented movies, TV shows and music videos from iTunes Store, they are M4V formats, if you have some MP4 players, you can't play them on your MP4 player like mobile phones, and PSP and so on. In the case, M4V Converter Plus for Win comes up, which is designed for helping Windows users to convert M4V files to MP4 so as to play MP4 files on any MP4 video player as need. For the latest version of M4V Converter Plus for Win, it supports iTunes 12.1.2 or later for Windows (64-bit), which other similar products don't have the same function. That is to say, Windows 64-bit users with iTunes 12.1.2 or later can use M4V Converter to convert DRM videos to DRM-free MP4 format easily. M4V Converter Plus for Win supports 30+ faster conversion speed, when you choose the Same as source (MOV / MP4) as the output format. Think that, it only need 30min to finish converting one 120min HD movie. It is so unbelievable. The fast M4V Converter to MP4 is also a professional DRM removal for Windows, and users can easily remove DRM from the purchased videos and the rented videos from iTunes Store with the help of M4V Converter Plus for Win. 1. Click the Download button to get the free trial version of M4V Converter to MP4 for Windows. If you are Mac users, click here(Mac Version) to download the latest Mac version. 2. Install the M4V Converter and click the icon to run the software. 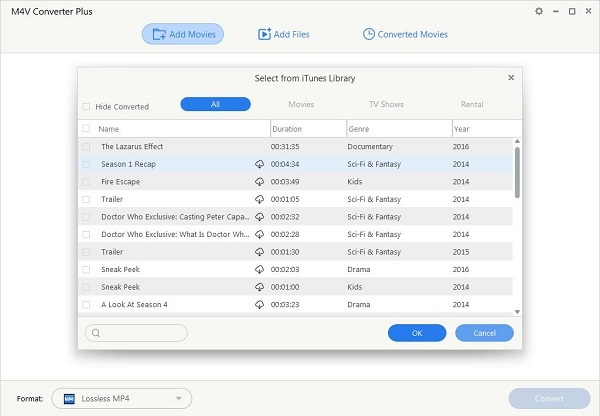 Click Add Movies button to import the file, and the M4V Converter will auto-open Movies library of iTunes Store. If you want to convert TV shows or Rentals, change the library and select to add them. 3. 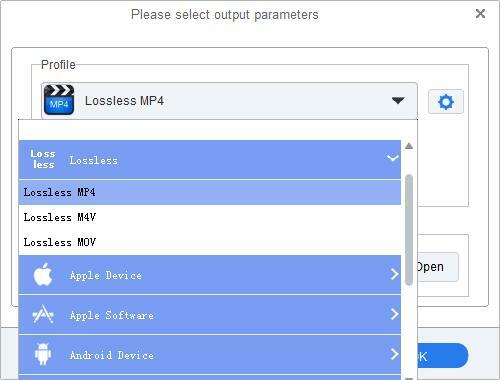 Select MP4 as output format. Choose the video, in the drop-down list of Convert to, choose the Same as source for mp4. And you can not only get the converted MP4 videos at 30+ faster conversion speed. It is so cool! 4. Now click Convert to start M4V to MP4 converting.